Synopsis: It starts with a trip to a local amusement park. David Harwood is hoping a carefree day will help dispel his wife Jan’s recent depression that has led to frightening thoughts of suicide. Instead, a day of fun with their son Ethan turns into a nightmare. When Jan disappears from the park, David’s worst fears seem to have come true. But when he goes to the police to report her missing, the facts start to indicate something very different. The park’s records show that only two tickets were purchased, and CCTV shows no evidence that Jan ever entered the park at all. Suddenly David’s story starts to look suspicious – and the police to wonder if Jan’s already dead, murdered by her husband. This book is brilliant! Linwood Barclay true to form, an absolute page turning, roller coaster (sorry, bad pun) of a read: go buy it! I’m tempted to leave the review there actually… kinda sums it all up! 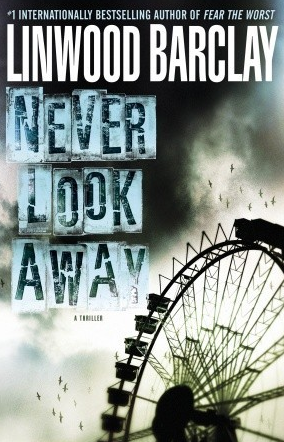 I think my favourite Linwood Barclay novel is still Never Saw It Coming (I loved that book), but Never Look Away is coming in as a close second. They are completely different storylines, with a completely different feeling to the book but each has that same mounting sense of tension and that same ‘unputdownable’ quality. I adore the characters that Linwood (I even love his name; excuse the gushing, I’m not usually a gusher) creates. The female cop in Never Saw It Coming is just inspired, she is a fabulous character. I often read books failing to find any connection or empathy with the main protagonist, let alone the side characters but each and every one of Linwood’s burst to life in my mind and become fully fledging living and breathing people with whom you cannot help but form a relationship. David and Jan are a real, believable couple. His parents are real, Jan’s ‘parents’ are real. Each person and their relationships to others is so well crafted and yet within so few words. It is an incredible skill and I take my hat off to Linwood Barclay for being able to create such deep and wonderful situations for me to enjoy. Ok so maybe they aren’t just for me but you get the idea. All in all a very enjoyable read with several subplots alongside the main story, highly recommended.